If you have a garbage disposal, you probably know that term is a bit of a misnomer because it doesn’t truly function like a garbage bin. While it effectively grinds and gurgles away certain food items, other scraps are best collected in the sink and then thrown away. I learned this lesson the hard way with potato peels (still sorry, mom and dad). If you don’t have a garbage disposal, then you know it’s even more imperative to keep food scraps out of your sink. Luckily, there are a couple of accessories on the market to make your dinner prep worry-free and to help keep your sink unclogged. Strainers are a vital component to your sink as they prevent food scraps from clogging the drain. But they can also function as a stopper so you can fill your sink with water and tackle those dirty dishes. There are two kinds of strainers available - standard and basket. Standard strainers: a shallow metal strainer with a plunger button to open or close the drain. The perforation patterns can vary, ranging from small to large holes, and slots. Basket strainers: a basket-shaped strainer that is about two or three inches deep, with a handle and a lid. The basket is mesh or perforated metal, so it's easily removed, cleaned, and replaced. So how do you choose which strainer is best for you? A benefit of selecting the basket strainer is that it can collect more scraps before you have to empty it. If you do a significant amount of food prep and don’t have a garbage disposal, this model will save you time and hassle. But if your sink has a garbage disposal, then the standard strainer should suit your needs. If you spend a lot of time prepping food and cooking, you might enjoy a larger strainer for your sink. These strainers suspend from the rim of the sink, and act as a colander to keep food raised. The elevated design prevents remnant water from contaminating your food. 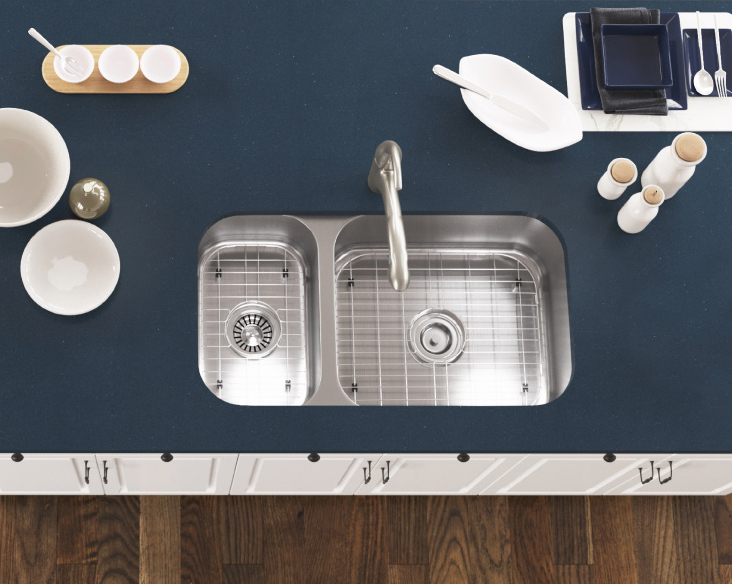 It also equips your sink area with an extra food prep area. They come in a variety of shapes, sizes and materials, such as mesh, perforated metal, or plastic. To add an extra layer of protection for your sink, I recommend a stainless steel sink grid. These accessories come equipped with rubber feet and sit in the bottom of your sink to act as a protective barrier. Additionally, they provide a space-saving place for your dishes to drip dry. The best part about these accessories? Sieve and save. They are one-time investments that make dinner prep hassle-free and keep your sink looking like new. Better yet, they can also save you hundreds of dollars in costly plumbing repairs.